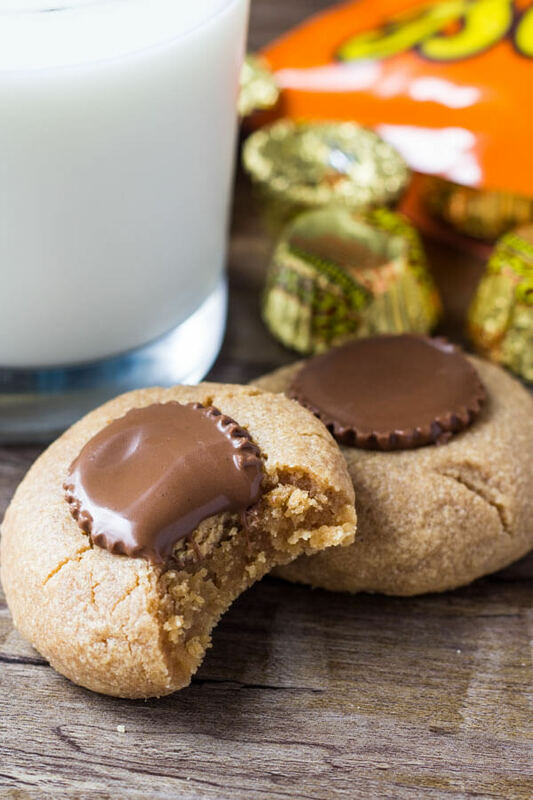 4 ingredients & 15 minutes is all you need to make these Reese’s peanut butter cup cookies. They’re stuffed with a peanut butter cup, soft & chewy, completely flourless and filled with big peanut butter flavor. 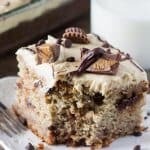 Seriously – if you love peanut butter – you’re going to LOVE these! I don’t know about you, but I absolutely love Reese’s Peanut Butter Cups. They’re probably my favorite candy, and definitely my favorite candy to bake with. And they’re stuffed with Reese’s. Now, at first I was suspicious when I saw recipes for 3 ingredient peanut butter cookies on Pinterest. But it turns out they taste delicious. They have big peanut butter flavor, are soft & chewy – and you only need peanut butter, sugar and an egg to make them. Then to take these to the next level, I decided to add peanut butter cups – so they become 4 ingredient peanut butter cookies. After the cookies come out of the oven, a miniature Reese’s peanut butter cup is placed on the top each. Similar to peanut butter blossoms – but with an extra dose of peanut butter. 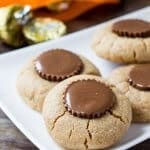 These Reese’s peanut butter cup cookies are the easiest cookies I’ve ever made, and they’re always so quick to disappear. Better yet – I always have peanut butter, sugar and an egg already in my kitchen. So it’s a quick trip to 7-11 (it’s close than the grocery store) for the peanut butter cups and I’m ready to go. And it’s 15 minutes to peanut butter bliss. 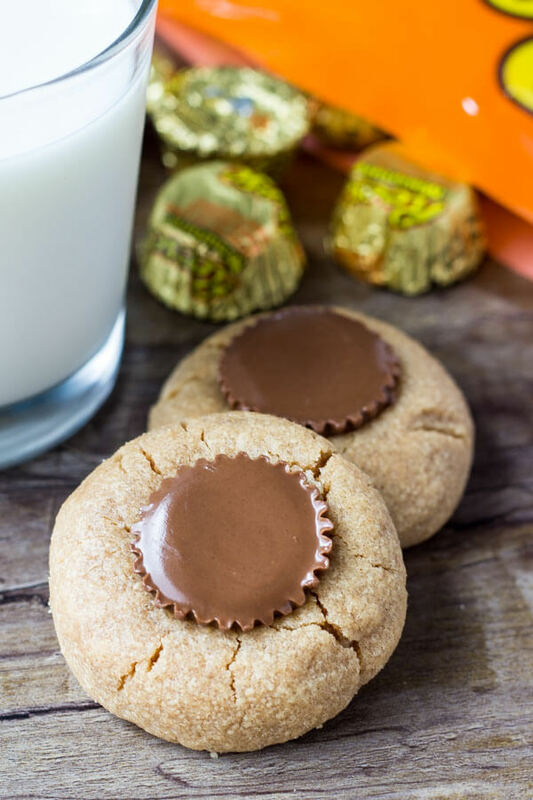 Seriously – you’re going to love these Reese’s Peanut Butter Cookies! 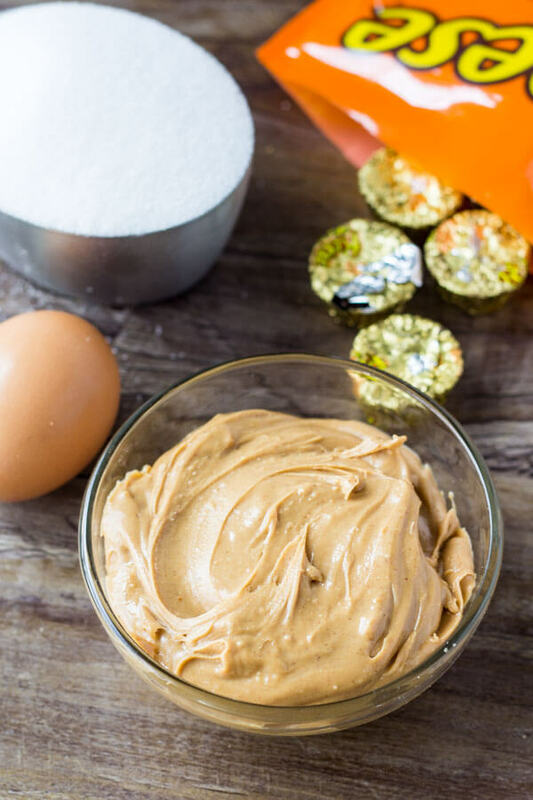 In a medium bowl beat together the peanut butter, sugar and egg. Form the dough into balls about 1 to 1.5 tablespoons in size. Place on a lined baking sheet about 2 inches apart. Bake in the preheated oven for 8-10 minutes, or until the tops look almost set. 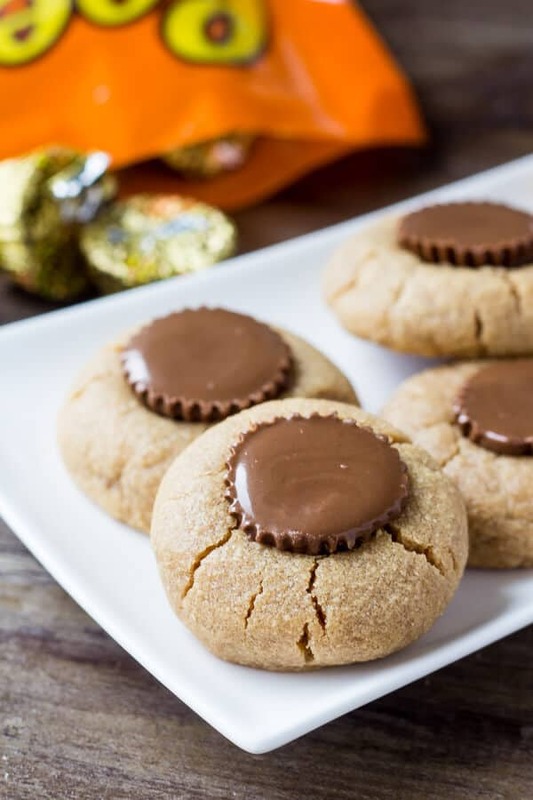 Remove from the oven and gently press an unwrapped peanut butter cup into the top of each cookie. 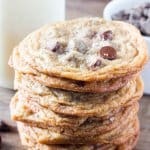 If you love peanut butter cookies – make sure to check out these other favorites too! These are so easy…which makes them SO dangerous in my house!!! Plus, they’re gluten-free (which means healthy, right?!). I tried them with coconut sugar as that’s what I had on hand, and they turned out great.